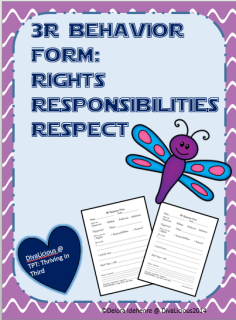 Based on the principles of positive discipline, this handbook focuses on the rights of students, their responsibility and showing respect. It is broken down into school situations and lets students know what is expected in each situation. It includes rewards and consequences. It also has problem solving tips and a response form students use when they have acted in an inappropriate way. The form helps students think about what they did and what would have been a better choice. The student must also create a plan to help them make good choices. Written in simple language, so that it can be used in a primary classroom.